Airedale Springs chairman Tim Parkinson (left) with Keighley MP Kris Hopkins (Centre left) and Marrose Abrasives Managing Director Tony Day (right) at the Northern Powerhouse reception at No. 11 Downing Street. BUSINESS LEADERS from the Keighley district attended a top-level Government reception focused on the creation of a Northern Powerhouse earlier in the month. Tony Day – MD of Marrose Abrasives in Keighley – and Tim Parkinson, Chairman of Airedale Springs Haworth, were among prominent business people from across the country to attend the event. 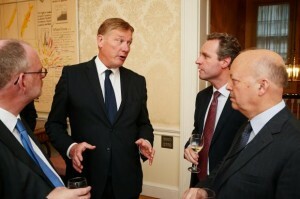 The duo accompanied MP Kris Hopkins to the Downing Street gathering, hosted by the Chancellor of the Exchequer, Rt. Hon. George Osborne, MP. Mr Hopkins said: “Closing the North-South economic gap is a core Government objective and it is important that senior ministers have a regular opportunity to hear the views of businessmen and women from our region. Mr Day said it was an honour to be invited to meet the Chancellor and hear more about the Northern Powerhouse. “As a world-class manufacturer of abrasive wheels – 80 per cent of which are exported to industrialised countries – the concept of the Northern Powerhouse is of great importance to Marrose Abrasives,” he added. Mr Parkinson agreed that good transport links were vital and added that the reception provided an ideal opportunity to raise issues. “Airedale Springs is a supporter of the reopening of the rail line between Skipton and Colne linking the Aire Valley and East Lancashire,” he said.